FYI - Tripped across this on the interwebs. Full list of SX OEM accessories with US$ prices. Weird. The parts are up on the Kawasaki website, but the bags have a different part # 99994-0568, same parts from Versys 650 and Ninja 1000. It has to be the same bags, they just attach another part # to it so they can track H2 SX accessory sales? Also, I think this is the first bike I've seen with an optional helmet lock....at $115! So by getting the bags you have a built in helmet lock, so it's like a $115 discount on the bags. Yah, I think it's best to just wait on the bags and not order them with the bike. 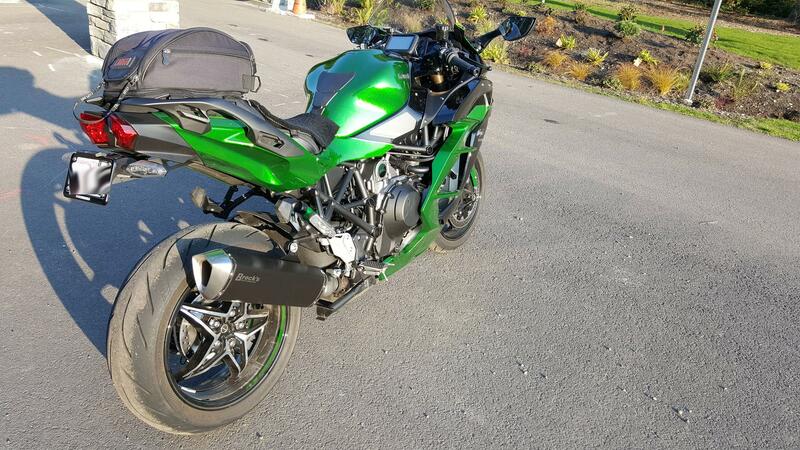 You should be able to get the bags for a nice discount through any Kawasaki parts dealer online and tax-free vs. buying them with the bike at the dealer. And yeah, the no helmet lock seems like a random exclusion...maybe it will make it on the bike for the production version. Total comes to $1214.75. As you state, surely you will be able to buy them cheaper somewhere else. I remember ordering my 2002 VFR bags from the UK and had them shipped over. I guess that's the price you pay for a matching, integrated, and keyed bag system as opposed to Givi (which aren't exactly "inexpensive" anyway). the idea of an optional lower seat is very nice, but I'm going to wait to see what the aftermarket offers for my short legs. Yep, they are kind of spendy, but I'll definitely be springing for the factory bags. A good set is indepensible for daily life on a bike.